Test-score performance is up among all Maryland students over the last decade, including low-income students. However, while all students are doing better on test scores, disparity gaps—the difference in test scores between low-income students and their peers—remain stubbornly high. That assessment comes from the American Legislative Exchange Council’s 19th Annual Report Card on American Education. Maryland ranked among the highest in the nation (11th) for performance on the National Assessment of Education Progress (NAEP) assessments, but received a D+ on educational policy. ALEC graded the state poorly for its charter law, private school choice programs, and teacher preparation, quality, and retention. 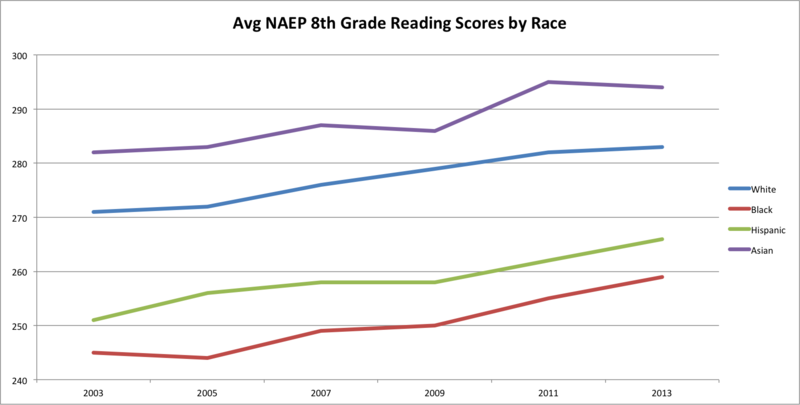 Maryland students showed vast improvement on the bi-annual NAEP assessments between 2003 and 2013. 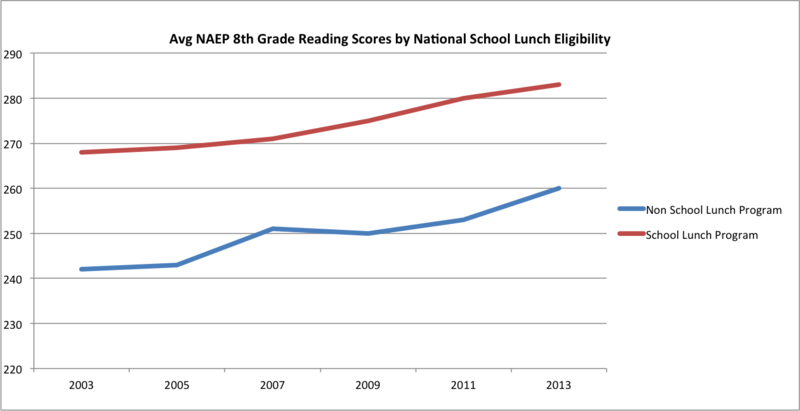 NAEP administers reading and math assessments to samples of fourth and eighth graders to students in all 50 states. 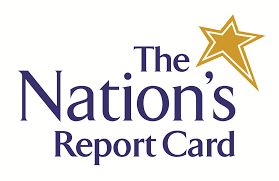 Maryland ranked second in the nation (13 points) behind the District of Columbia in point gains for all students on the NAEP fourth-grade reading exam. The national average was four points. 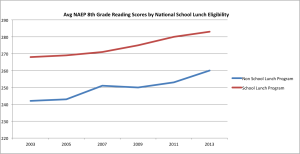 Maryland ranked 7th (24 percent) for free and reduced price lunch students scoring “proficient” or better on the NAEP fourth-grade reading exam, four points above the national average of 20 percent. The state was #1 in the nation for point gains (12) on the NAEP eighth-grade reading exam, well above the national average of five points. Maryland students also showed significant gains on the NAEP fourth-grade math assessment good for 5th in the nation with a 12-point gain. Maryland’s low-income fourth graders did not fare so well on the NAEP math assessment as only 24 percent scored proficient or better (39th), two points below the national average. 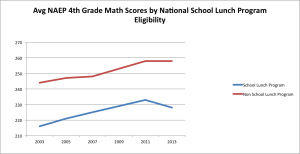 Maryland’s eighth-graders improved their score on the NAEP math assessment by nine points, two points above the national average good for 17th in the nation. 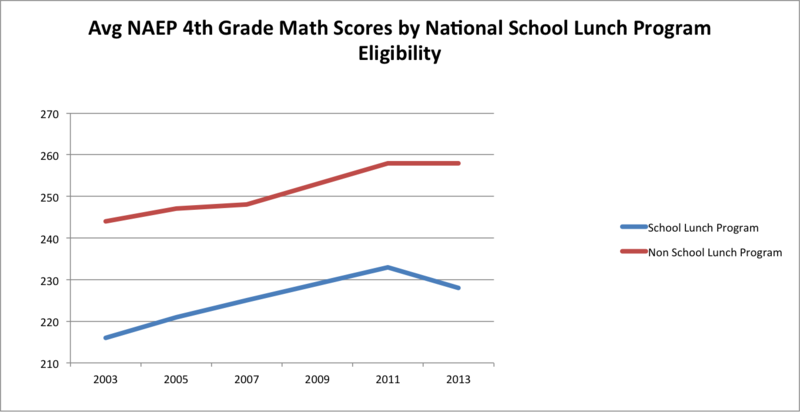 Only 20 percent of low-income eighth-graders scored proficient or better on the NAEP math assessment, right at the national average. Maryland ranked 24th in the nation on this metric. While Maryland’s overall test scores increased in the decade 2003-2013, low-income, minority students did not fare as well as their peers. The report ranked the states according to the performance of low-income students in large city schools. Maryland ranked second to last in the nation, just ahead of Michigan, with only 10 percent of students in large cities scoring proficient or better on the 2013 NAEP fourth-grade reading assessment. These students only showed a 2-point score gain on the assessment. The disparities are readily apparent in Baltimore City where only 10 percent scored proficient or better on the Trial Urban District NAEP fourth-grade reading assessment. Baltimore City’s eighth-graders fared a little better with 14 percent scoring proficient or better on the Trial Urban district assessment. Why is the achievement gap widening while Maryland’s student test scores are improving across the board? Matthew Ladner, an author of the report said, “Maryland is an interesting case, we don’t know why.” “One answer is that they are good at blocking and tackling at a district level with standards-based reform.” Ladner said. Ladner and his co-author David Myslinski argue that is extremely difficult to assess the effects of state policy on achievement. Readers should also appreciate the complexity of the relationship between state policy and student learning. State policy serves as only a single variable that has the potential to influence academic outcomes. Students learn at home and at school, not in state legislative chambers. Put differently, the positive or negative impact of state policy on student learning begins its journey in state capitals and passes through a sprawling system of public, private and home-schools. If state policies ultimately fail to meaningfully impact classroom practice, inspire greater activity from students and/or educators or provide new options for students and parents, state policymakers can often find themselves pushing on a string. For the last several years, Maryland boasted the top schools in the nation according to Education Week’s Quality Counts report. However, Education Week’s metrics weigh inputs such as spending more heavily than student achievement. Buried in the 2011-2013 Quality Counts reports, which ranked Maryland schools number one in the nation, were data showing the state was dead last eighth-grade math poverty gap for those years. 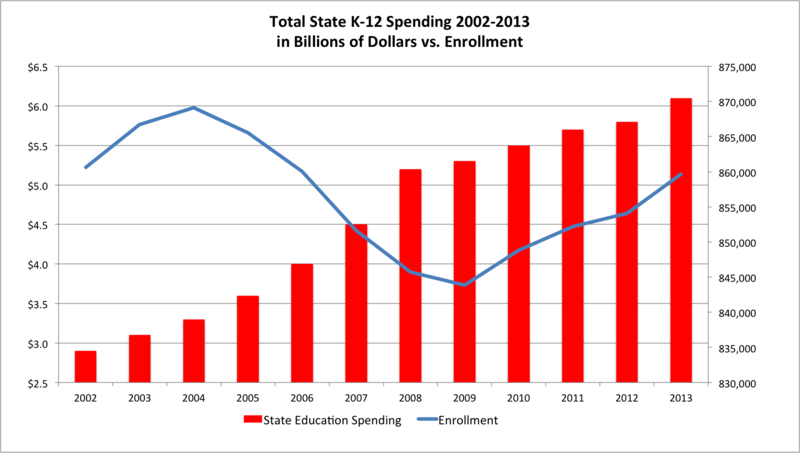 Since 2002, due to the Bridge to Excellence (Thornton) funding mandates, state K-12 education spending has jumped by $3.2 billion, a 110 percent increase. The state legislature approved the Thornton mandates to address and eliminate the disparities, yet despite the massive increase in spending the disparities remain, and in some cases are growing. Strengthening Maryland’s weak charter law and school choice policies could make a difference in closing the disparity gaps. Ladner and Myslinski looked at the Louisiana Recovery School Districts (RSD) and found remarkable success among the students in those programs. The Louisiana RSD program, created to rebuild New Orleans schools in the wake of Hurricane Katrina, allowed for the use of public school facilities—through a competitive process—by charter school operators. The RSD provided oversight and non-performing charter operators were dismissed if they failed to meet academic standards the RSD program. RDS program students had faster test score gains and learned at a faster pace than their district peers. A Stanford University study found that New Orleans RSD students had on average the equivalent of 120 and 150 additional days of reading and math respectively. Facilities were key to the success RSD model as other charter programs rely on philanthropy to purchase or rent their facilities. Use of existing public school facilities alleviated the financial pressure to the RSD charter operators. The student success through RSD is turning out to produce a large return on the investment of public dollars. The Louisiana RSD model is market-based system that ensures its product (the education it provides) meets the needs of its customers (students and parents). The problem with Maryland’s education system is that it conflates its customers for its product. In Maryland, the state and its political interests are the customer, and its products are the students that it provides to meet those interests. Until Maryland’s education system realigns itself, the disparities will stubbornly remain. The ALEC report card also found Maryland lacking in teacher quality policies earning a grade of D+. Maryland was lacking in delivering well prepared teachers, expanding the teaching pool, identifying effective teachers, retaining effective teachers, and exiting ineffective teachers.